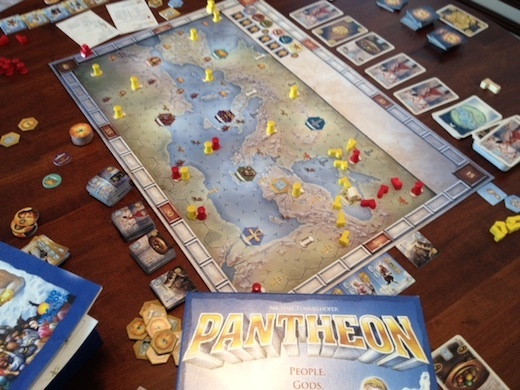 One of Rio Grande Games' newest titles is Pantheon. Since I like so many of their other titles, I decided to try this one. The first thing that I will note about Pantheon isn't really a pro or con, just an observation. From what I have seen, there are really two main strategies in Pantheon - you can attempt to build a lot of columns (the more you have, the more points they are worth, and ideally you want to place all of them if you want to win), or you can attempt to buy sacrifice tiles in order to gain the favor of the gods. When you gain the favor of the gods, you do this with a combination of sacrifice cards in your hand and sacrifice tiles you have purchased. 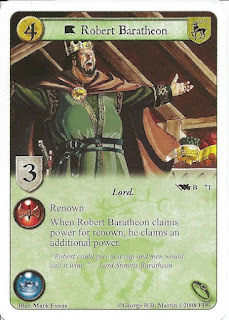 But, sacrifice tiles don't go away after you use them (whereas you discard the used sacrifice cards). So, later in the game, if a player has purchased higher level sacrifice tiles, he will be able to gain the favor of many of the gods without even needing to draw extra cards. This is an incredibly strong strategy, and initially I thought it was overpowered. However (finally getting to my observation), I think that a player really needs to choose one of these two strategies if he wants to win. There is no middle ground. If a player attempts to both build monuments and gain the favor of the gods, he will probably lose. The monument strategy is viable, because monuments become more valuable as you place more of them, so the difference between placing all of your monuments and placing all but one of your monuments changes the score from 48 points down to 33 points! (You will also want to place as many monuments as you can early so that you can score as much as possible in the scoring phase after the third epoch.) Also, the better your sacrifice tiles are, the more easily you will be able to claim god tiles. So, having mediocre sacrifice tiles will force you to continue drawing cards while the other player is completing his empire. Choose one strategy and stick with it! Now, with that said, it's time for pros and cons. The first thing that I really enjoyed about Pantheon encompassed everything about movement. Specifically, each player starts with a few monuments and feet (yes, feet) available to be placed. This selection is incredibly limited. 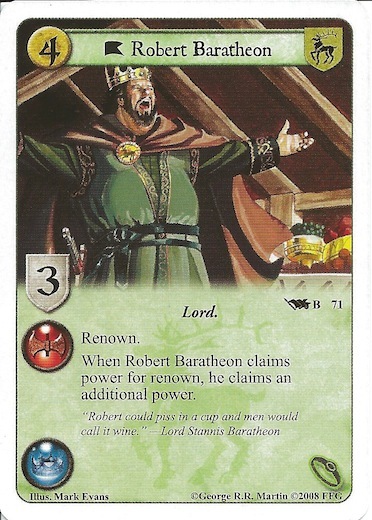 But, in your buy action, you can purchase more feet and columns, which then can be played on a future turn. I thought this worked well. Also, I like that the monuments remain on the board, whereas the feet are removed after each epoch. This means that once you have enough feet unlocked, you only have to worry about unlocking monuments so that you can place them (again, because you want to place them all). 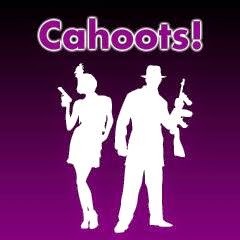 I also like the bonuses you can get to movement, the fact that some "booty" tokens unlock more feet and monuments for you, and that you can place feet with movement or a buy action (depending on if you want other people to place feet as well - and what cards are in your hand). However, though I thought that there were a lot of unique and fun things about Pantheon (I wasn't exhaustive on my pros), there were several drawbacks as well. First, I was a bit disappointed with the actual production quality of the game. Without trying, I can think of three different typos in the game instructions/components, and also one place where the wrong image was inserted. Things happen, and I understand that. However, the typos would have been easily caught by any spell checker ("popints"). Whereas, I play games enough that I understand that the hobby board game industry is very small and can't afford a lot of proofreaders and editors (and, for that matter, I periodically find typos and grammatical errors in published books as well), these kinds of things would prevent me from showing Pantheon to my non-gaming friends, as I wouldn't want them to think that the board games I play aren't high quality. My next con (actually game related!) is that the end of the game feels very anti-climactic. At the beginning, players are doing a lot of work building up their empire, and each epoch will probably last a decent amount of time. However, towards the end of the game, the epoch might only last a few turns. 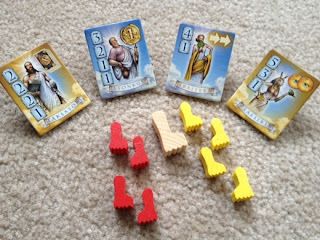 If players have purchased high level sacrifice tiles, they will be able to gain god tiles without having to play any cards, and player using the monument strategy will either have a lot of feet unlocked (so that they are ready to place many of them on their turn), or might even be out of monuments to place by the last epoch (this happened to me once). I felt like the game should have been scaled more to have more activity in each epoch, instead of the last couple of epochs being glorified scoring rounds for the player collecting god tiles. Overall, I give Pantheon an 8.0/10. It was a fun game, and I enjoyed my plays with it - honestly, I'd be up for playing it more. However, I don't know that it has the staying power of a lot of Rio Grande's other titles. If you like Pantheon, you might also want to check out Babel, Caylus, and The Heavens of Olympus. I would like to thank Rio Grande Games for providing me with a review copy of Pantheon. 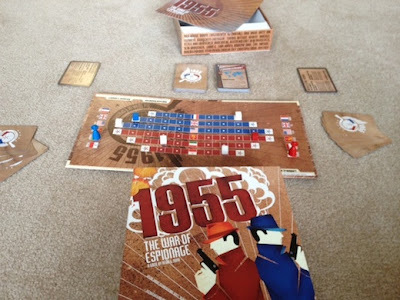 Today's review is of a Kickstarted game called 1955: The War of Espionage. The first thing that I like about 1955 is the critical role of your spy. "He" is your main conduit for influencing the board - in fact, he's the thing that changes this game from a boring game where you simply play whatever you draw (and have no decisions to make) to actually playing with strategy. You can place him in order to stack several cards in an influence action that you are planning for your next turn, or you can place him in an effort to thwart your opponent's influence. However, if you defend with too many cards, then on your own turn you will be limited in your actions (which is a nice balance). If you are close to securing a country, it might be important to place your spy there so that you have more options of what you can play. Conversely, if you have a lot of cards that match a certain country, you might place your spy in that country in order to combine those cards for maximum effect. The next thing that I like about 1955 is that you can defend - and yet the defense isn't overpowering. If defending were too appealing, or too powerful, then the game would be very dull. ("I will influence the USA." "I'll block." "Ok, I'll influence Poland." "No, I'll counter." etc.) However, the fact that you can defend means that you're not completely at your opponent's mercy about whether a country moves. However, defending is limited - you can only defend in your home country and where your spy is. 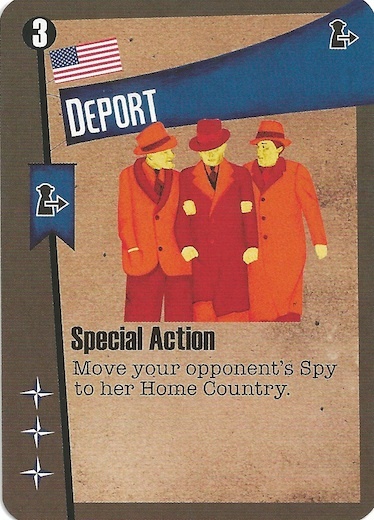 And, there are some special cards that allow your opponent to move your spy to your home country. So, the only place that you are guaranteed to have an opportunity to defend is your home country - but if you don't have the right cards to defend with, even this can fail. Yet, stopping your opponent from securing his third country can be the difference between winning and losing the game! My third pro, which I mentioned briefly before, is that I like the balancing elements of this game. For example, when you defend against a powerful influence action, you will probably have to spend a lot of cards from your hand. This causes your options to be very limited on your own turn (since you don't draw until the end of it). Another balancing element is that some of the special actions can help setup a powerful attack (like moving your opponent's spy out of your way) - but these are balanced by costing one of your two "card plays" for the turn. And, then you can't use the card for influence. With all that I've said about 1955, there are still a couple of parts of the game that I'm not a huge fan of. First, the game can be heavily influenced by draw. In the games that I've played, this hasn't been a huge factor, but if one player is regularly drawing the 4-influence cards (which also have better special actions) and the other player is drawing mostly 2-influence cards, then the person with better cards will have a major advantage. 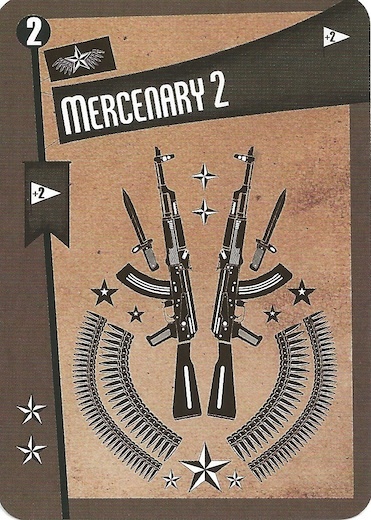 What I've seen more in my games is that if one player draws a lot of Mercenaries (these can be added to any influence action, regardless of where your spy is), then they could have a serious advantage. My other con for 1955 is that towards the end of the game, many of your cards can be essentially worthless influence-wise (and may not have useful Special Actions). This happens more if you are forced to defend. Here's what happens - towards the end of the game, you and your opponent will probably have some countries seduced (secured). You cannot play a card in these countries for influence. Fortunately, you can still play cards that show those countries on the country that your spy is in and on your home country. However, if you have a blue home country, and your spy was defending in a different blue country, then all of the cards that you would have played to defend would have been blue. Which means the cards left in your hand are red. Playing a card of the opposite color of the country you're influencing (because your spy is there or it's your home country) makes your card have one less influence. So, playing a 2-influence card is only worth one influence. And, the special action may not be helpful. So, essentially, you wind up wasting your turn. This is part of the balance I talked about earlier, but is still a bit of a nuisance when it happens. The last thing that I will mention before I conclude the review is something that I was a bit surprised by, but wasn't really a pro or a con. I was surprised by how little we used Special Actions in this game. This may have been influenced by our style of play more than the game itself (I'm not convinced of that), but it seemed like we only played a Special Action every few turns. Now, this isn't to say that Special Actions aren't important - the ones that we played were often very powerful, but I think I was just expecting to play them more often. One of the games we played, I even said "Ok, I'm going to try to use Special Actions as often as I think they're appropriate, so that I get a good feel for them." Sure enough, even that game we spent most of the time playing cards for influence rather than Special Actions. If you are looking for quality 2-player games, you might also like Summoner Wars, Mr. Jack and (the admittedly much bigger) BattleLore. I would like to thank Ape Games for providing me with a review copy of 1955: The War of Espionage. A game that was sent to me before I had even heard of it was Ranking! In Ranking, you and your opponents will... rank various items. Each round there will be a question posed - something like, "Which is found more often in the forest?" From here, each player selects one of the tiles they have in their hand that they believe most accurately answers the question. You add in a few random tiles, mix them up, and reveal them. Now, players take turns ranking items. The active player will select two items on the same row and explain why one fits the question better than the other - moving one up and the other down. After any ranking, the other players may guess what the active player's tile was by placing a "guess marker" on the guessed tile. Play continues until at least one tile is in the top (6) spot, and at least one tile is in the bottom (0) spot. At this point, each player gets a number of points equal to their tile's current place on the tower (from 0-6), but loses a point for each person that correctly guessed their tile (to a minimum of 0 points for the round). Play continues like this until one person scores 15 points. The first pro about Ranking has to be the replayability. People that enjoy this game will be able to play it forever without ever playing the same game twice. Between the 46 two-sided questions, and the 120 pictures, you are given significantly more components than you will ever need in any single game. Even if you did eventually play the exact same game where you used the same questions and had the same tiles appear (I'd estimate this to be approximately a 1 in a million chance), the reasoning that the players use for moving tiles would still be different, so the game would truly change. Before the next pro, I must make a confession. After receiving Ranking, I did not expect much from it - I read through the rules, but missed the part where the game was supposed to be "good" or "fun." However, this is why I actually play the game before reviewing it. 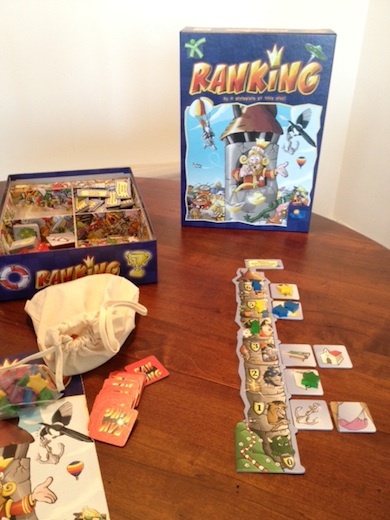 Ranking features a storytelling aspect similar to Dixit. Therefore, I think that this game would truly appeal to creative people that enjoy making up stories. After all, you could take any two pictures and justifiably move either one up or down. For example, we had a question of "What is more likely to be lost or left behind?" One of the tiles was a treasure chest. Two of us immediately thought, "The treasure chest is least likely to be lost, because it's huge!" One of the other players thought, "You bury a treasure chest, so of course you leave it behind!" Therefore, when played with the right people, this storytelling aspect of the game can be quite enjoyable. The final pro that I will mention about Ranking is that it has a bluffing element to it. If you are very obvious about which piece you are moving each round, people will quickly realize that it is your tile - and if they guess your tile correctly, you can lose a lot of points (both from losing points on the guessing and from them moving your tile down). Therefore, you have to strike a careful balance between moving several pieces around, and still trying to make yours move to the top (which can be easy if other people happen to be moving your tile for you). With the pros I mentioned, there are still some cons for Ranking. First, the last player to rank a piece normally has a pretty major disadvantage. Once they do the final ranking, there is no reason that all of the other players shouldn't guess which tile is theirs. And, most likely, they are going to guess one of the tiles at the top (especially if you just moved a tile into the 6 position). But, players will quickly realize this, and so the con starts to mitigate itself as a wise player will learn to bluff better about which piece is his - possibly including moving someone else's tile to the top rank and attempting to get his to the second highest. This also isn't a major issue if the players start guessing earlier in the round. I would say that the biggest con with Ranking is that if it isn't played with the right people, or in the right mindset, it can be very dull. When we first started playing, we even caught ourselves falling into this trap. We explained why we were moving the first few pieces, but then we started just moving pieces without saying anything. We were cutting out the creative and interactive part of the game! I can see far too many groups of people (read "strategy gamers") looking at the game from a strictly strategic nature and trying to play (and judge) it accordingly. This means that a lot of people will not enjoy Ranking. Essentially, I see Ranking as a party game to play when you have a very small party. If you were wanting to just spend time socially with friends, and only 2-4 people showed up (the game is 3-5, but I counted you as already there), you could pull out Ranking. So, it seems to be a party game for a very small audience. The final con that I will mention is related to one of my pros. I enjoy the storytelling aspect of Ranking, and I compared it to Dixit. However, Dixit does a very good job of giving you something incredibly ambiguous to tell stories about, whereas Ranking gives you pictures of fairly concrete objects. This makes the storytelling more constrained - especially since if you are very creative with your explanations, people will assume that you're just trying to make up reasons to move your own tile higher. Overall, I give Ranking a 6.5/10. I rarely reference my scoring chart (mainly because it might change), but I currently have 6-7 as "Game can be played sometimes, probably has niche groups which may enjoy it." I think that perfectly summarizes my feelings on Ranking. 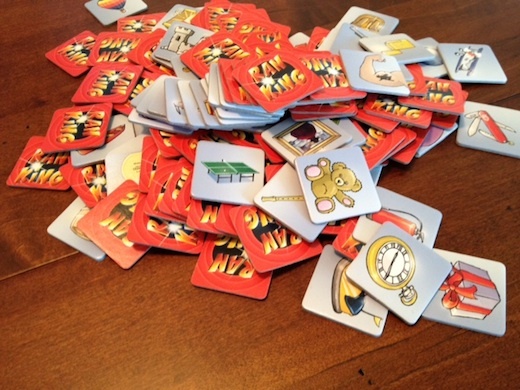 There are some people that will get a copy of it and love it as a small party game. However, I see many people (who read this site) preferring something more strategic. If you like party games, you might also want to check out Say Anything, Wits and Wagers, and Train of Thought. I would like to thank Rio Grande Games for providing me with a review copy of Ranking. Ok, we need to start this review off with a confession: I've already reviewed Hive here. In fact, it was one of my first reviews. Unfortunately, in my early reviews I was very eager to write as many reviews as I could (and did so on most of the really popular games), but I wasn't very good at diving into what made a game good or bad (of course, this is good or bad in my opinion). Hopefully in the year or more that I've been writing this blog now, I've developed a better writing style. Because of this, I'm going to start occasionally "archiving" some of these older reviews; starting with Hive. This essentially means that I'm going to rename the old post to have "Archive" in the title instead of Review, and will remove it from the alphabetical review list. I will also make a note on the original post linking it to the newer review. With all that said, let me start telling you about how great of a game Hive is! In Hive, each player takes on the role of an insect swarm attempting to capture their opponent's queen (who, obviously, must be a usurper to their queen's throne). To do this, you alternate taking turns - which consist of placing new insects (you cannot touch your opponent's pieces with the newly placed insect) or moving an existing piece. And, so that you don't hide your queen forever, she must be placed in one of your first three turns. Now to the insects. Your insect horde consists of grasshoppers, spiders (yes, yes, they're not "officially" insects, but you'll have to ignore that), beetles, ants, and (of course) the queen bee. Grasshoppers jump directly across a line, spiders move exactly three spaces, beetles move one space (but can move on top of other pieces), ants can move to any space along the outside of the game, and the queen can move exactly one space. Play continues back and forth until one queen is surrounded. The first thing that I like about Hive is the way that you can trap your opponent's pieces. Specifically, one of the movement rules restricts anyone from splitting the hive into two disconnected sections. This allows a shrewd player to move a piece (such as an ant) to where it is only touching one single piece - the piece he doesn't want his opponent to move. Once you have moved your piece into position, your opponent will no longer be able to move that piece because he would split the hive; he at least cannot move it until he brings other pieces along to reshape the hive. The next thing that I like about Hive is the fact that the queen can move. She is often hindered by one of the other movement rules - you cannot move any pieces except the beetle and the grasshopper into a place that they cannot slide into. Hive is played with hexagonal shaped tiles, and thus you can create "choke points" where a piece is not able to slide in (by surrounding most of the sides of the position you want to block). This rule will often prevent the queen (who is normally at least partially surrounded... after all, that is the point of the game) from moving. However, when she is able to move, you can often completely throw your opponent's strategy into disarray. They will be stuck desperately trying to reposition their units while you capitalize by (hopefully) surrounding their queen! The next thing I like about Hive is related to the actual components of the game itself. The game is incredibly portable and also a great tactile experience - and all with no setup time. The game (at least the edition I purchased) comes with a travel bag, which allows for the game to be thrown into a backpack and carried with you. If you also factor in the fact that there is no board, the game can be easily setup anywhere ("coffee shop") and play can begin as soon as the pieces are separated. Finally, the high quality tiles themselves make the game feel classy. The final pro that I will mention about Hive is that I like the differences in the insects. Each piece is useful, but in very different ways. The person who wins the game will be the person who is best able to capitalize on the strengths of each piece. The easiest strategy to grasp is the ants, as it's fairly apparent that their speed allows them to move quickly to trap enemy pieces or to fill some of the spaces around an opposing queen. However, once you master some of the more subtle strategies such as moving a beetle on top of an opponent's piece so that you can start placing next to it, your play of Hive will advance to another level. I cannot say that I am incredibly skilled at Hive, but I do enjoy getting to challenge myself by finding new strategies and watching my opponents counter me at every move. Now one thing that you need to be aware of with Hive is that there is no random element to the game. There is no dice rolling, nor is there any shuffling and random draw. Similar to chess (and many abstract strategy games like Yinsh and Pentago), every facet of the game is completely visible to both players and so Hive is a challenge to see which player can out-think the other - not which player can out-roll the other. I personally like some element of random chance in games, but I can also appreciate games like Hive which are completely strategy based; as long as they are fast paced, which Hive is. Overall, I give Hive an 8.5/10. I think that it is a masterful game that you should look to try out (if you haven't already). 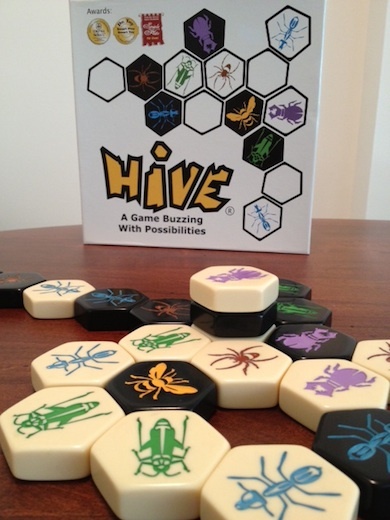 If you want another opinion on this game, check out this Hive Review from the Board Game Family. Or if you have already decided that you like Hive, you might also be interested in checking out Atlanteon, Abalone, Gipf, and Rise! 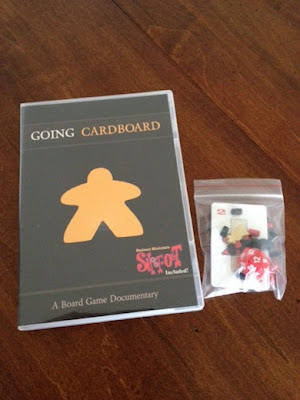 So, for my second board game related DVD review, we have Going Cardboard: A Board Game Documentary (the first one was Under the Boardwalk: The Monopoly Story). 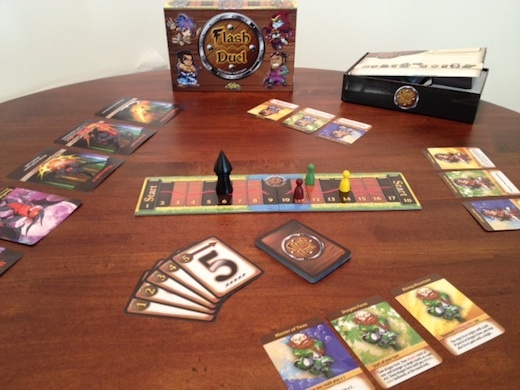 In Going Cardboard, you are taken into the world of designer board games. You are introduced to Essen, the largest board game convention in the world, and you get to hear information about many different facets of the industry. One of the interesting features is the explanation of the "Spiel des Jahres" award (German Game of the Year), and how it has helped shape this industry by creating an award worth winning (monetarily). Because the award was worth winning, designers and publishers will put more effort into trying to win the award - thus improving the overall quality of games. (DVD's get pros and cons like board games right? Well, I'm going to give them to you, either way.) The first pro for Going Cardboard was the people interviewed. Some of the people contributing to the film include the founder of Rio Grande Games, the founder of Z-Man Games, and the designers of Dominion, Battlestar Galactica, Settlers of Catan, and Power Grid. They also included one of the co-founders of Days of Wonder, and the top people at both Funagain games and Game Salute. Oh, and Reiner Knizia. (Who is important enough to get his own sentence. In case you don't know who Reiner Knizia is, he seems to have designed about a quarter of the games that exist today. Some of the ones I've reviewed that he designed include Ra, Tigris and Euphrates, Through the Desert, and Lord of the Rings.) There are very few people that I can think of who I would have liked to seen interviewed that were not included. The only one that comes to mind is Christian T. Peterson, founder of Fantasy Flight Games. Because of this list of guests, the next element of Going Cardboard that I liked is that I truly learned more about the industry. Honestly, I have been interested in the inner workings of the board game industry for long enough that I knew a decent amount of what was included. However, it was still fascinating to get to learn simple things like how Rio Grande Games acquired it's name, how many people attend Essen as compared to GenCon and Origins, and how Dominion was able to get signed by a publisher. However, with all of the aspects of Going Cardboard that I found interesting, I think that the biggest con to me was that I found it hard to follow what the overall story of the documentary was (or if there even was one). At the beginning of the movie, they talk about the Spiel des Jahres, and then this transitions into various well known games such as Settlers of Catan and Ticket to Ride (along with people's feelings on Monopoly). Next, they discuss how various people started game clubs and smaller conventions. Among this they splice in the size of the game collections of some of the interviewees. Transition briefly into local game stores. Also mixed in is the story of Frost Forge Games and it's rough road to becoming a game publisher through Kickstarter (instead of having their debut title published by an established publisher). You eventually get to Essen and how fun and exciting that can be. These were all very interesting segments, but they didn't seem to flow well from one to the next. The next con that I had for Going Cardboard was that the sound and video quality wasn't always top notch. Notably, in all of the segments when Tom Vasel (host of the Dice Tower, and probably the most well known game reviewer actively reviewing games) was interviewed, the sound always had an echoing quality. Some of the other interviews that were filmed at conventions also (not surprisingly) suffered from a large amount of background noise that made it more difficult to hear. Finally, many of the segments that were filmed in conventions had some challenging video quality. (The documentary actually starts off with footage of the opening of Essen when thousands of people are pouring into the convention hall. Unfortunately, this many people causes the ground to shake, and thus the camera (that I assume was on a tripod) was shaking along with it.) Small things like this, inconsistency about whether segments would have background music, and the fact that the DVD menu doesn't even have a chapters option for you to jump to a certain part of the film (and that one interviewee checks his phone during the interview!!) unfortunately allowed you to realize that the film was a small budget (Kickstarter) production. As a final note that is my preference but isn't really a pro or con about the movie itself is that I would have preferred extended interview segments from the different participants. I realize that the producers were using artistic license as they transitioned from one interview to the next, thus keeping the segment more focused on a topic. However, with the people being interviewed, I would have loved to see an extended interview with many of these people. Not just a snipet of how Rio Grande Games was formed, but for Jay Tummelson to tell me the whole story of how the company came to exist. The same for Zev Shlasinger of Z-Man Games, and from many of the designers. The DVD comes with a game! (Not surprisingly by Reiner Knizia.) Aside from this, the only special features are interviews and segments that didn't make it into the feature of the film for some reason. I found many of these to be interesting. There is one about how Battlestar Galactica was developed by Fantasy Flight; another was about the history of Funagain Games. One was about the founding of Days of Wonder, another was about self-publishing. There are around 20 of these segments, and I found many of them to be very interesting, and I'm glad that they were included. 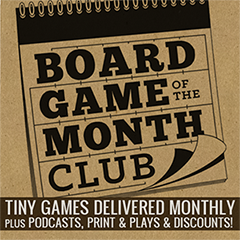 If you are interested in Going Cardboard, then you probably play a lot of games - but have you played some of the fun but fairly unknown games like Jin Li, Mob Ties, and Wok Star? Ok, so I have to start this review with a confession. I love Monopoly. I realize that this confession will not necessarily be popular among many of my readers who wish to disassociate themselves as much as possible from the game. However, after growing up playing it, I still enjoy the game as an adult. I have many, many other games now, so it doesn't hit my table often - but when it does, I still enjoy this classic. 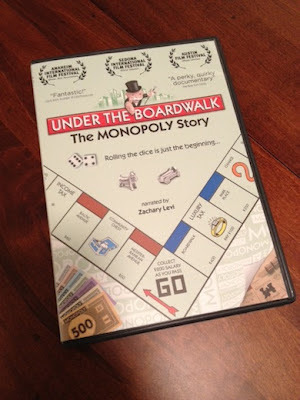 So, when I heard about the Monopoly DVD documentary Under the Boardwalk: The Monopoly Story, I was very intrigued. Ok, here's the next confession - I review board games; not DVDs. In fact, this will be my first DVD review, but as long as DVDs continue to be made about board games (which I think my readers will find interesting), I'll continue to review them. The Feature - "The Monopoly Story"
Whereas this is called "The Monopoly Story", I think it would be better titled, "Chronicles of the 2009 Monopoly World Championship." The film features several hopeful competitors who are attempting to win first the U.S. National Monopoly Championship (for which you win approximately $20,000 - the amount of money found in a game of Monopoly), and then the 2009 World Monopoly Championship. And, along the way, they also give you more information about the game itself. Among chronicling the 2009 World Championship, Under the Boardwalk throws in some fascinating information and history of the game of Monopoly. For history, the documentary starts with it's origins as the "Landlord's Game", and continues through it's gradual reshaping until it because the game that Charles Darrow invented - which, FYI, was played on a round board! For random facts, do you know where the largest Monopoly board in the world is - or how large it is? I do - and if you watch the film, you will too (well, at least until you forget). 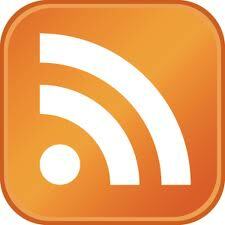 I found all of these factual tidbits to be very engaging. I wish that they had focused more on this aspect, but isn't one of the trademarks of a good documentary the fact that it leaves you wanting to know more? Finally, I must say that I was impressed with the overall quality of the film. I had no idea what to expect going in. I knew it was about Monopoly, and that was enough for me. I had no idea if this was a small-budget or large-budget movie. (To be fair, I still have no idea.) However, with footage included from the national championships of New Zealand, Singapore, Mexico, Canada, and the United States (among others), the film truly feels exhaustive. There are a couple places where I noticed the sound being a bit less than perfect, but I believe that was because of the volume of what was recorded (I believe they were recording the announcer at one of the tournaments who was on a microphone). In case the feature film wasn't enough, the DVD also features some extras that are pretty nice. First, you can take the full 20 question quiz that all National Champion hopefuls must attempt in order to gain entry into the National Tournament (I got approximately 14 out of 20 correct). Next, they also feature the full (42-minute) 2009 World Championship final game! I realize that many people will not understand this (unless, of course, you enjoy Monopoly enough to buy a DVD about it), but I can see myself watching this at some point! Overall, I give Under the Boardwalk a 9.5/10. I have no idea how to score DVDs, so take that how you will. However, I really enjoyed the DVD and consider it to be something that any Monopoly fan should definitely try to watch! I would like to thank the filmmakers of Under the Boardwalk for providing me with a review copy of their film. And, if you love Monopoly, you might also want to read about Monopoly Deal - a spinoff of the classic game of Monopoly. So, a time comes in every gamers life when he looks at the closet and realizes - in order to get more games, I either need to buy a bigger closet or clear out some of the games currently present. And therefore - it was time for a giveaway. Congratulations! Will there be more giveaways like this? I really don't know yet. Either way, thanks to all of my followers out there for being great and helping my site continue to grow! So, this is my very first "mini-review." Some games I really want to write about, but there's simply not that much to say about them. Now, instead of attempting to make up large (somewhat pointless) paragraphs, I'll simply label it a mini-review, and say what needs to be said. This will probably be used on simple games (like Stacket) or on expansions that don't add too many new elements to a game that I had previously reviewed (but are still worth talking about). Anyway, I just figured that I would explain what I meant by that term. Stacket is a fun little game that I think will appeal to the same people as Jenga. Whereas this isn't really most of my readers, there are tons of people that enjoy this kind of dexterity game. This also means that it is great for non-gamers. Whereas a lot of people (read "non-gamers") will stare blankly at you when you suggest playing an easy to learn game like Castle Panic, when you say, "hey, do you want to play Backwards Jenga?" They will be intrigued and many people will immediately be interested. It's a combination dexterity and party game. If you like both of those, then Stacket would be a great game for you. The same things that will attract people to Jenga will be what attracts people to Stacket - trying to make it just hard enough that the next person can't quite do what they need. Except, whereas in Jenga you only have the same rectangle shaped pieces, in Stacket you have different shaped objects that you create your tower with (this would be the second pro to the game - and for that matter, the game would be horribly boring if all of it's pieces were the same shape). There is one giant con with Stacket. It is a huge pain to try to put away. All of the odd shaped pieces are supposed to fit nicely together into the plastic briefcase-shaped box. However, this will probably not work very well on the first try (unless you've lost a lot of the pieces). 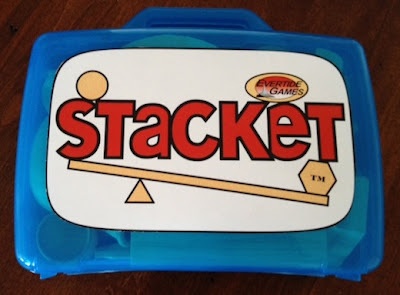 After each game of Stacket, I normally spend 1-5 minutes moving pieces around hoping to successfully shut the lid in what amounts to a giant 3D puzzle. Overall, I give Stacket an 8.0/10. 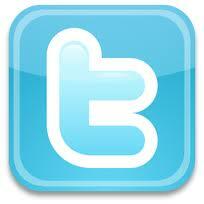 I think that it is a fun game that is easily accessible to anyone. It won't appeal to a lot of the strategy gamers that read my blog, but I think that it would appeal to a lot more people than most anything that I normally review. Whereas the game is "officially" aimed at people 13+, I think that this would be a great game to play with kids 7 and above. If you like dexterity games, you might also like PitchCar, Caveman Curling, and Fastrack. I would like to thank Evertide Games for providing me with a review copy of Stacket - which, as of this writing, is available on Kickstarter. Recently I've been trying out several games by smaller publishers. One of the ones with a strong reputation is Sirlin Games (makers of Puzzle Strike) - so I took an opportunity to try out Flash Duel. In Flash Duel, you take on the role of a fighter that is trying to knock out his opponent. Fortunately for you, your opponent has a glass jaw - one hit and you'll take him down for the round (unless you're playing the dragon scenario). Unfortunately, you're a bit of a wimp, too, and you have the same weakness. 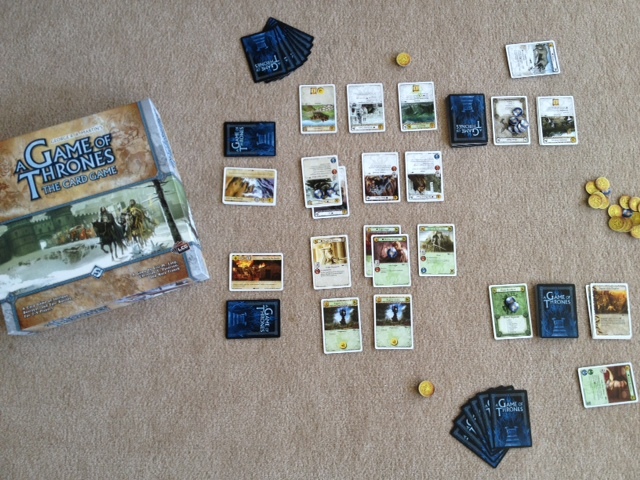 To start the game, you each get five cards in your hand. These cards have a numeric value from 1 to 5. On your turn, you play a card - using this card you can either move, "push" your opponent backwards, or attack. 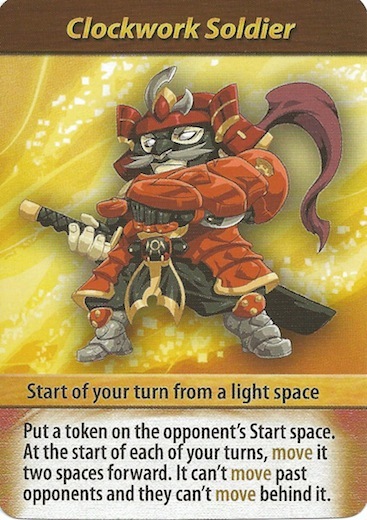 In order to attack, the card played must represent the distance between you and your opponent. 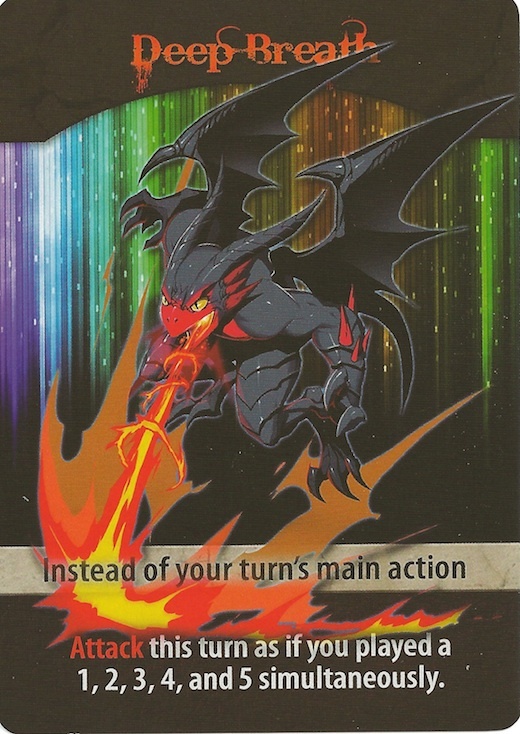 If you have several copies of the needed card, you can play all of them to "power up" your attack - thus forcing your opponent to play the same number of the card in order to block. If he can't, then he goes down, and you win the round. Also, after a move, you have the opportunity to do an attack (in the same way as a standard attack). However, this move/attack combo is called a "dashing strike." If your opponent cannot block your dashing strike, they have the option of playing a card to retreat (instead of getting knocked out), but then on their turn all they can do is draw cards. At the end of your turn, you draw back up to five cards. Play continues like this until a player is hit with an attack (at which time they collapse into a heap and lose the round), or the draw deck runs out. If the deck runs out, you each have one last opportunity to hit each other, and then whoever has advanced further along the track is declared the winner (in the "you couldn't hurt a fly" (also known as the "I like dancing better than boxing") division). After a round, you reset the board and go again. You typically play either best out of 3 or best out of 5. Another thing that I like about Flash Duel is that there are 20 different characters that you can use - each with his own abilities. Even more than this, there is also a "Clockwork" mode in which you can select powers from several different characters. This allows you some variability between games so that you don't feel like you're doing the exact same thing every time. 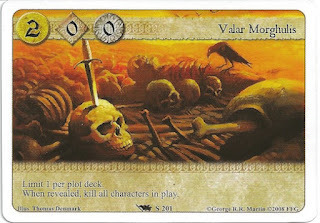 However, the game will primarily still come down to whoever makes the best use of the cards they draw. Finally, Flash Duel just "flows" well as a game. It is pretty smooth and intuitive. It doesn't take a long time to setup, and can be played with just about anybody. In this way, it's the epitome of what a "filler" game should be - a nice way of spending time while waiting until a longer game starts. My first con with Flash Duel is that the characters don't seem well balanced. Yes, you could argue this with me, and tell me about how each character is best in certain situations. That's fine, but from the games I have played, there seem to be some characters that have much more useful abilities than others (after all abilities like, "Draw until you have 6 cards total" after retreating from a dashing strike isn't especially helpful, since you would have drawn up to 5 cards on your turn anyway.) Fortunately, if you get too frustrated by this, you can simply play the Clockwork mode instead of the standard fighting mode, and you can select the abilities you want to use. My only other real complaint with the game is that it seems to cost too much for what it is. I recently have thought this about a different game because of the limited number of components. That is definitely not the case with Flash Duel. I feel like the number and quality of components that you receive for the list price of $35 is just fine. However, the game takes 5 minutes to play. The box claims 15 minutes, but I'm guessing that is a best out of 5 scenario, or includes setup time. (Including reading the rules?) To me $35 just seems a bit too high for a 5 minute game. If you like fighting games, you might also check out Yomi, BattleCON, or Jab. 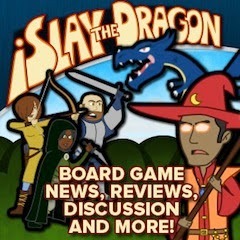 I would like to thank Sirlin Games for providing me with a review copy of Flash Duel via Game Salute.